Hougang United FC’s hopes of climbing away from the bottom of the Great Eastern-Hyundai Singapore Premier League (SPL) took a severe beating after a 3-0 defeat by the Young Lions at Jalan Besar Stadium on Saturday evening. Hami Syahin struck in the first half, before further goals from Haiqal Pashia and Ikhsan Fandi cemented a well-deserved victory. It was an entertaining first half as both teams threw caution to the wind and went at each other. But of the two teams, the hosts carved out the better chances, first of which fell to Ifwat Ismail on 17 minutes. The striker found himself free in the box and shot on the turn, but Khairulhin Khalid was able to charge down his attempt. The Young Lions did not have to wait long to find the breakthrough as they went ahead in the 23rd minute. Ifwat spotted Prakash Raj’s run and released him with a superb ball down the right. The latter sent the ball across the face of goal and Hami ghosted in between two defenders to finish off from close range. 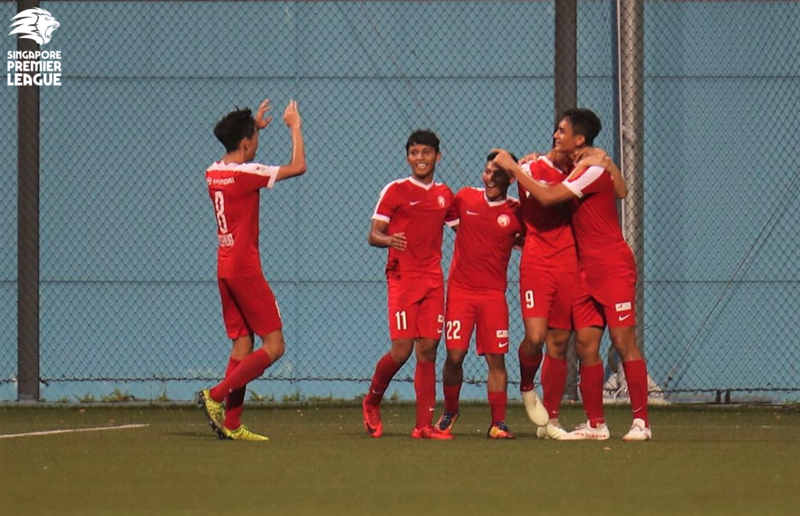 The hosts had their hearts in their mouths minutes later, as a Hougang corner nearly made its way into goal after Syed Firdaus Hassan’s attempted clearance went awry. It then should have been 2-0 in the 39th minute, with Joshua Pereira slipping a through ball to Rusyaidi Salime but the winger failed to beat Khairulhin in a one-on-one situation. It was a different game altogether in the second half, with the tempo slowing down after Young Lions preferred to sit back and play on the counter in order to protect their lead. It nearly paid off on several occasions, but Hougang were alert enough to snuff out any balls that came into their box. Both Pereira and Hami had opportunities to make their headers count, but neither could convert those chances as the Young Lions hung onto their slender lead. The action came to a standstill until the last ten minutes of the game. In the 81st minute, Shahfiq Ghani’s cross-shot was palmed away from goal and the resulting corner led to a break by Zulqarnaen Suzliman. With just two men between him and the Hougang goal, the midfielder’s electric pace saw him beat one before being taken out by another in Jordan Vestering, who was promptly given his marching orders. The Young Lions duly took advantage of their numerical advantage to overwhelm their opponents and score twice. First, Pereira’s cut-back was dummied by Ikhsan and Haiqal was left with an easy finish from close range in the 83rd minute. Ikhsan would score a similar effort in the 90th minute, this time finishing off Zulqarnaen’s ball to him to place the icing on the cake. Young Lions face a daunting task next as they take on champions-elect Albirex Niigata FC (S) on 18 July while Hougang will face Warriors FC on 1 August. Young Lions Head Coach Fandi Ahmad: “I thought we did very well with an under-strength team. It was a good result for us, we really pressed them, we defended very well, of course they have some good players but we tried to close them down today. Joshua and Firdaus did a very good job in closing down the midfield today. “Today we were very competitive. It was a very good game for both sides. We already knew they were going to play the long ball so we were also concerned about Fazrul because he has a good scoring record, but the boys did their best so it is a huge relief for us. Hougang Caretaker Head Coach Clement Teo: “Naturally we are very disappointed, but it happens. As a caretaker coach, I take full responsibility of the loss. “What was lacking was the tactical awareness. Yes, we had three young midfield players, but I felt they could have done the job. Unfortunately, in terms of tactical aspect, they were a bit lacking. Defensively we were a bit shaky. As you can see in the second half, we managed more possession, we were moving the ball around more freely. Young Lions: Zharfan Rohaizad (GK), Joshua Pereira (C), Zulqarnaen Suzliman, Syahrul Sazali, Hami Syahin (Ikhsan Fandi 80’), Syed Firdaus Hassan, Prakash Raj (Amer Hakeem 83’), R. Aaravin, Taufiq Muqminin, Jacob Mahler, Ifwat Ismail (Haiqal Pashia 51’). Unused subs: Hairul Syirhan (GK), Danial Syafiq, Asshukrie Wahid, Amirul Hakim. Hougang: Khairulhin Khalid (GK), Fabian Kwok (C), Iqbal Hussain, Illyas Lee, Justin Hui (Syukri Bashir 81’), Faiz Salleh, Muhaimin Suhaimi (Shafiq Ghani 69’), Amir Zalani (Antoine Viterale 74’), Syqair Sulaiman, Fazrul Nawaz, Jordan Vestering. Unused subs: Zulfairuuz Rudy (GK), Ashrul Syafeeq, Syahiran Miswan, Stanely Ng.